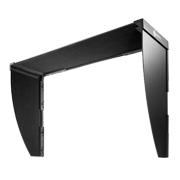 These light-shielding hoods effectively prevent glare on the monitor’s screen caused by ambient lighting. 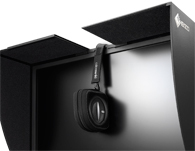 The CH2700 and CH2400 feature a new design and attach to the monitor magnetically. This allows you to attach the hood quickly and easily without needing to connect separate parts. The CH7, CH6, and CH5 have a sliding plate that allows you to easily attach and remove a calibration sensor. The inside of the hood is made with anti-glare material. The CH7 and CH5 can be used in portrait mode as well.